If you’re a part of the comic book community, more specifically the one on the internet, you know that something always has people upset. No, I’m not talking about you just lost a game of checkers upset. I’m talking about that your girlfriend just cheated on you and you can beat up the guy without consequences upset. I’m being a bit hyperbolic, but seriously, not really. The comic book community on the internet is one of the whiniest, entitled, and selfish group of individuals you’ll come across. Sometimes our passion comes off as arrogance. That arrogance turns into rude comments or behavior, and bam! You’ve got yourself an internet fight, baby. Lately, the thing upsetting people today on the internet is the current Marvel Comics event, Secret Empire. Don’t know what that is? I envy you. To keep it short, Secret Empire is a story about Captain America being a Hydra Agent. Instead of becoming one later in life, this story has seen his reality altered so that Steve Rogers grew up to be a Hydra agent. This has sparked every debate from Nazism to President Trump to a writer’s responsibility in comics. Some argue Marvel is tanking. Others argue that Nick Spencer is the writing god himself. I just like to stay in the background because people are stubborn in what they believe. Hardly ever do you meet someone on the internet willing to dissect and understand someone else’s opinion. If you do meet those people, cherish them forever. But with all of the negativity going around recently, I got an idea. Instead of focusing on anything negative in our community, instead of reviewing things on my site and saying why I don’t like them, I’m going to ONLY focus on positive things. Not people or different aspects of nerd culture, but mainly why I love certain heroes and comics in general. I’d like to welcome everyone reading to the beginning of the “Why I Love” series. Comics are too great to constantly talk about controversial topics such as Secret Empire, diversity, or quality. While all of these things need to be discussed by fans, the comic book community has shown me they have a hard time treating each other with respect. Before I start this series off, I want to welcome anyone back to my site who has read my articles or reviews before. I haven’t posted in a while. And to those who are reading my work for the first time, welcome. This is my biggest passion and I love to share it with others. Sometimes I talk about things that some people may not like. Whether that’s race, politics, or life in general, know that I don’t care if you read this or not. I’m not trying to force anything on you, so if I offend you with my thoughts (Like Batman v. Superman was one of the worst superhero films of all time) then leave. Simple. What I want to talk about today is why I love the Green Lanterns. Nope, not Hal Jordan or John Stewart. 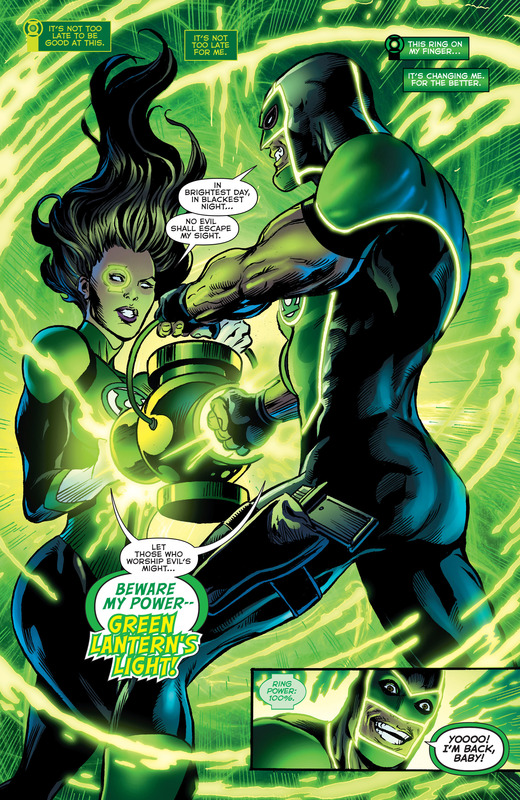 But why I love the two new Green Lanterns, Simon Baz and Jessica Cruz. 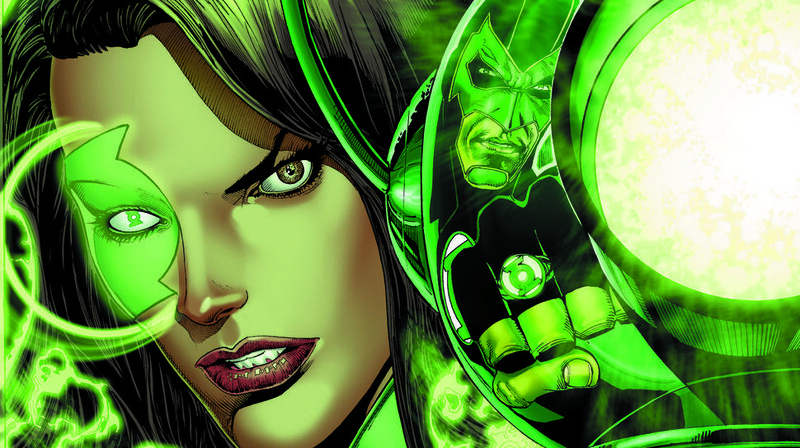 They’re the current Green Lanterns of Earth and current members of the Justice League. They showed up in the New 52 Justice League comics but now have their own Rebirth series. They couldn’t be further apart, personality wise, but together, they work well as a team. They have no choice. In their first issue, they failed a training exercise designed by Hal Jordan. He linked their rings to the same power battery, so they are forced to work with each other. DC Comics knows how to craft characters. I think Marvel has gotten more creative in years past and currently with the creation of their characters (powers, abilities, costumes, etc.) but DC Comics knows how to build a hero from the inside out. These two are no different. 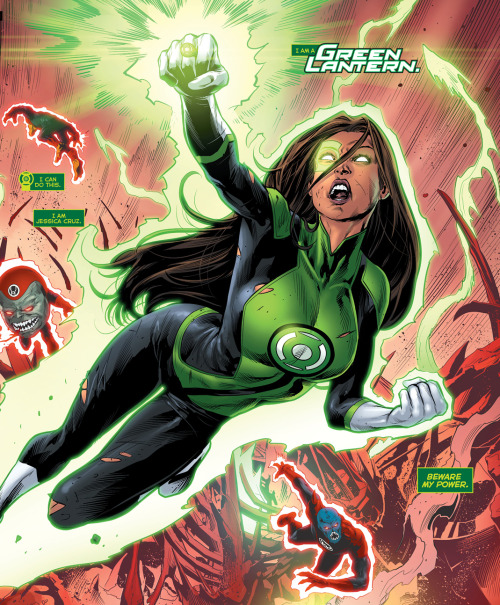 Let’s start with Jessica Cruz. She was created by genius writer Geoff Johns. Both heroes come from dark pasts, but completely different pasts. Jessica suffers from anxiety. Not the “I’m scared to take this test, but going to anyway,” type of anxiety either. Jessica has a hard time getting out of bed. Every single day. She’s a beautiful girl. She’s smart and very resourceful. The world is her oyster, but she can’t kick her anxiety. Why? Well, Jessica witnessed the murder of her best friends. They stumbled across some men burying a body while on a trip and her friends were brutally murdered. Jessica escaped and her ring came to her after. This sparked her anxiety and forced her into exile. She spent a full three years locked in her apartment. This isn’t new for superheroes but it isn’t a common trait of anyone in the Justice League, and definitely not a Green Lantern, who’s power is based off their ability to overcome. Jessica questions every move she makes. Sometimes it makes her look weak, but this is a real condition that people without superpowers go through every day. Anxiety can lead to depression and depression can lead to suicide. The “point” I guess of her character is to show the severity of anxiety. Her partner, Simon, is more bull headed and doesn’t hesitate for a fight. He constantly nags Jessica in the beginning of their relationship. In issue #15 of their Rebirth series he asks her if she can just kick her anxiety. She’s appalled at his insensitivity and tells him it isn’t something she can just get rid of. Most DC characters have battles like this all the time. It’s not with their villains or the world around them, but with themselves. Doesn’t matter if you’re Batman or Wally West. Being a Green Lantern is almost the equivalent to being a god. That type of power is overwhelming. Jessica has to deal with her demons every second even though she has unlimited power. That type of vulnerability is something I love in heroes. I crave it honestly. Some heroes, like a Batman or Daredevil, tend to keep their emotions and demons in check. Sure, they’ll come pouring out at some point, but they can keep living. Heroes like Jessica Cruz or Martian Manhunter who wear their struggle for the world to see are more interesting to me. Because when they overcome their struggle, it’s one of the most satisfying moments as a reader. Jessica had a moment during Rebirth that made me get up and yell while I was reading. Their first story saw the two new Lanterns come up against the Red Lanterns. The constant bickering between them was annoying, but I knew they’d kick it eventually. Atrocitus, the leader of the Red Lanterns, unleashed his Red Tower on Earth and it was infecting people all over the planet with rage, the staple of the Red Lanterns. They called this event Red Dawn. Simon and Jessica had to destroy the tower to foil Atrocitus’ plans. After some setbacks, including Jessica being infected by rage, they infiltrate the tower, but get thrashed by the Red Lanterns. Cocky Simon tried to fight Atrocitus by himself and Jessica’s anxiety got the best of her again. She couldn’t move. That’s how the issue ended. Why I love this character though came in the next issue. She overcame her fear, and began slicing through the Red Lanterns base. Jessica couldn’t create a construct for the first six issues of this story (you know how Green Lanterns can make anything with their mind? Yeah, Jessica couldn’t do that.) She made something resembling a lotus flower and it destroyed the tower and cured every one of their rage. The Red Lanterns were defeated. Next up, Simon Baz. The reason I love Simon is his struggle as well. He’s the first Middle Eastern Green Lantern. He’s also a Muslim. Baz was also created by Geoff Johns, who is half Lebanese. Johns is from Michigan, and Baz is from Michigan. I currently live in Michigan and attend Johns’ alma mater, Michigan State, so yeah, that’s all I’m saying. Baz was a wild child, always getting in trouble, always causing his parents headaches. The main thing Simon was involved in was street races and petty crimes. One of his races injured his brother-in-law. Simon is eventually locked up when a car he steals has a bomb in it. Since he’s Muslim, it’s seen as an act of terrorism. I love this background for him because yes, the profiling of Muslims in this country is terrible, but Simon isn’t an angel. He’s rough around the edges and has to overcome his attitude. He wasn’t just sent to jail. He was sent to Guantanamo Bay and the authorities had no plans of him leaving anytime soon. While in jail, his ring comes to him and he’s accused of stealing the ring from Hal Jordan. Baz is the more experienced of the two, so he talks down to Jessica sometimes. When they first met, I said they argued a lot. Well, the arguments mainly consisted of Baz telling Jessica how much of a disappointment she was as a Green Lantern. It wasn’t fun to read, but over the series, they’ve become good friends and Simon has grown up. The thing he struggles with is his fear of not being strong enough and his lack of trust. This fear manifests itself as arrogance more often than not, but he is vulnerable sometimes. Baz carries a gun. It’s symbolic of his insecurity. With his powers, it seems idiotic to carry a gun, but Baz doesn’t see it that way. Issue #4 saw the best conversation between the two. Jessica had overcome her rage and was determined she wasn’t right for the job. She wanted to quit. Simon convinced her not to and admitted his fear of not being good enough. He admits that sometimes, he wonders if he’s the thug they arrested and the failure his family thought he was. Jessica tells him that he’s not. It was a beautiful moment for both characters. The best page of the entire series came next as the two of them charged their rings with their power battery. There have been moments where Baz flirts with the idea of immense power. 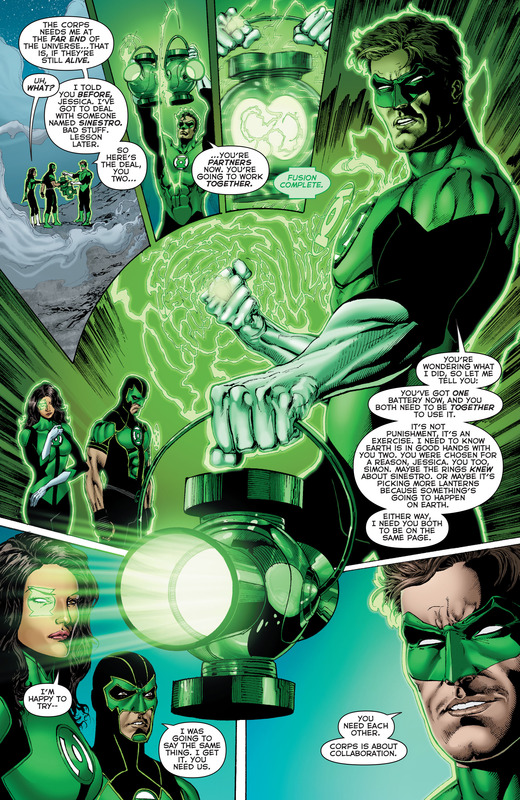 During the Phantom Lantern arc, there was a ring called the Phantom Ring. Anyone could wear it and it could harness the power of all the corps. Simon got a hold of it once and fell in love with the power he felt. In the end, Jessica convinces him not to use it, but I feel it’s something Simon will continue to struggle with throughout the series. Both heroes are flawed, but have iron wills. It makes them perfect to be Green Lanterns. Diversity is something that is always a hot topic in our community. If this is your first time reading anything I’ve written, I’m not one of those people who doesn’t want diversity. I LOVE diversity. Being black, I like seeing stories that relate to me and situations that relate to situations I’ve been in. But, I also love learning about new cultures as well. I love seeing other minorities represented. I don’t care who you are, or if you’re a minority, if you want your race or culture to be the majority, you don’t want diversity. White people in America, are the owners of that mentality, but blacks and other minority groups are flirting with it now too. I don’t give a damn what a hero looks like, but it’s nice to see different people, because our world is filled with different people. There are certain names that pop up when discussing diversity in comics. DC Comics doesn’t have many names that pop up in that conversation. DC Rebirth has been great, yes. The stories are quality and I’m excited for the future. But, there are hardly any black, Latino, Muslim, women, or any other minority characters at the forefront in the DC Universe. Except…there are. Simon Baz and Jessica Cruz are diversity in front of our faces. I don’t know the reason, but DC has given us a Muslim and Latina Green Lantern, and the internet has stayed silent. Simon Baz has an Arabic tattoo on his forearm that lights up when he’s in costume. For that fact alone, these characters deserve praise. DC deserves praise. They have a LONG way to go, but this is a positive step. I love the chance Geoff Johns took by creating these two characters and putting them on the Justice League. That’s a risky move and I hope people continue to accept real diversity when it’s presented to them. I didn’t want to get into heavy spoiler territory regarding their new Rebirth series, but everyone should check it out. It’s not the best written comic of all time, but if you like the Green Lanterns, you’ll like this. If you want to give someone new a chance, you’ll like them. If you crave diversity in comics and want a new perspective, you’ll learn to love these characters as I have. This series intrigued me when it was announced and so far, it has delivered. A fun story with some epic moments, and some cheesy moments. (One issue is all about them making cookies for Simon’s mom. Another is about Halloween) You need a solid mix of both if you’re going to keep readers interested. I should shout out writer Sam Humphries for the quality of this story so far. Jessica’s anxiety and Simon’s insecurity. Both will continue to fight and rise above, and both will grow as heroes. 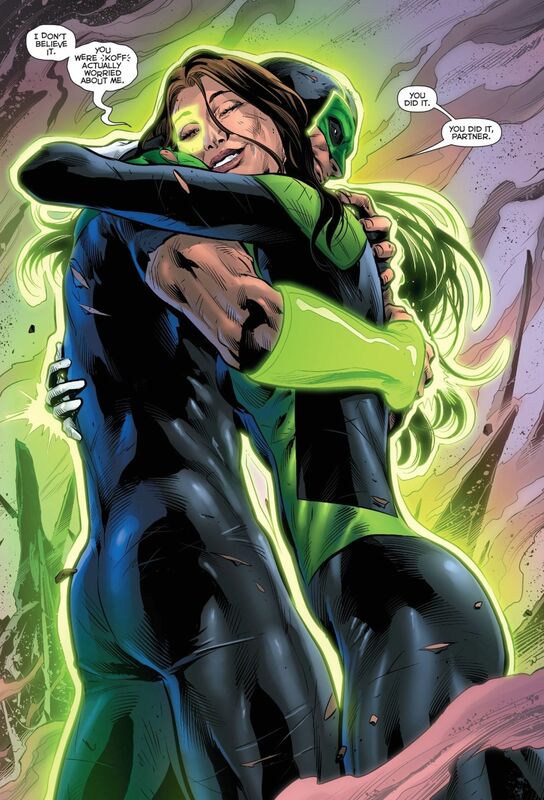 This, is why I love the Green Lanterns. I’m back, baby! This series has me really excited and I’m ready to share all of my loves, old and new, with you guys. Please make sure to follow me on Twitter @Hero_Review and make sure to share this piece so we can spread some good vibes back into the comic book community. Until next time! Reblogged this on Planet Nestor Entertainment.